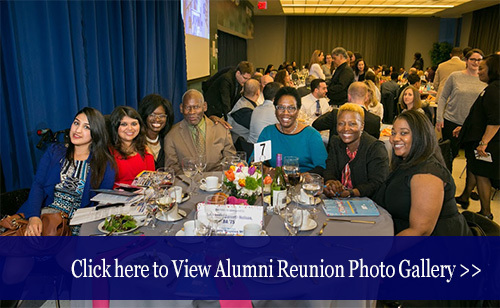 Hundreds of John Jay College alumni returned to their alma mater on April 21 and 22 for the annual Alumni Reunion Weekend, which included a special Founding Generation symposium to celebrate the 13-year tenure of President Jeremy Travis, who is stepping down on Aug. 1. 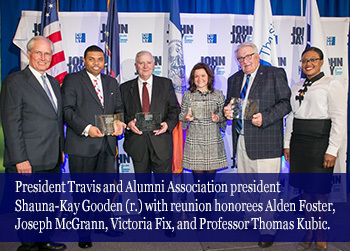 The awards dinner recognized three alumni — one of whom is a respected professor in John Jay’s Sciences Department — and a current John Jay sophomore, and was followed once again by a festive after-party. To begin the reunion weekend, President Travis sat for an interview conducted in a casual, conversational style by alumna and John Jay Foundation trustee LaBrenda Garrett Nelson and Distinguished Professor of English John Matteson. With a format that loosely followed that of the popular TV show “Inside the Actors Studio,” Travis fielded questions on a variety of topics, including his signature accomplishments as John Jay’s president, his interactions with various college constituencies, his plans for life after John Jay, and even his tastes in music. The conversation also included questions from the alumni in attendance. He earned his B.S. in Criminal Justice Administration and Planning in 2012. The Alumni Reunion Weekend continued on Saturday with the 5K Race for Justice, followed by a brunch and Family Day Carnival.